In this paper, a new calculation method for numerical simulation of astrophysical flow at the supercomputers is described. The co-design of parallel numerical algorithms for astrophysical simulations is described in detail. The hydrodynamical numerical model with stellar equations of state (EOS), numerical methods for solving the hyperbolic equations and a short description of the parallel implementation of the code are described. For problems using large amounts of RAM, for example, the collapse of a molecular cloud core, our code upgraded for Intel Memory Drive Technology (IMDT) support. 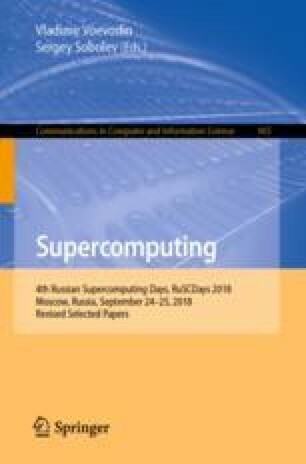 In this paper, we present the results of some IMDT performance tests based on Siberian Supercomputer Center facilities equipped with Intel Optane Memory. The results of numerical experiments of hydrodynamical simulations of the model stellar explosion are presented. The research work was supported by the Grant of the Russian Science Foundation (project 18-11-00044).